Windows 8 No Need to Computer Upgrade ~ " World Information "
Jakarta - Microsoft has introduced a preview anyarnya operating system, Windows 8. Good news for users of Windows 7 that want to upgrade. Microsoft said users of Windows 7 does not need a higher hardware specification to run Windows 8. "Windows 8 will be able to run on multiple machines because it has system requirements that equal or lower than Windows 7," said Michael Angiulo from Microsoft. Windows 8 itself is said not only intended for a computer, but also focus developed for tablet devices. Interface Windows 8 is quite similar to Windows OS Phone 7, which optimized for touch navigation. In addition to having the hardware requirements are similar to Windows 7, Windows 8 is claimed to have no trouble running Windows applications 7. All this seems expected to make the adoption of Windows 8 will grow rapidly as users of Windows 7 does not need the hassle. 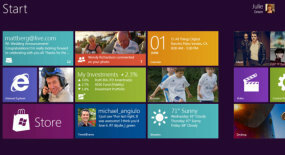 Windows 8 plan would be released in 2012 and is expected to Microsoft's success as its predecessors.